Great news for our region that Bristol has been shortlisted to become Channel 4’s national headquarters or one of its two new Creative Hubs. 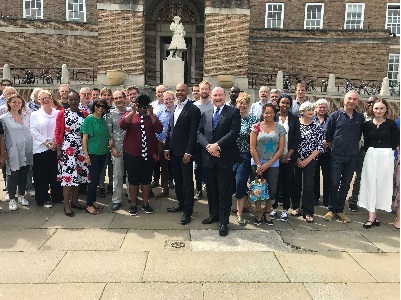 Our Invest Bristol and Bath team has worked incredibly hard on the bid and it’s fantastic to see their work recognised. leads the way in so many industries and it’s great to see the buzz this bid has generated in Bristol and beyond. I’ve been talking with business leaders from a wide range of sectors about the benefits it would bring and how we can all come together to back our bid. The ideas and talent coming through our creative sector is truly inspiring and I had the great pleasure of meeting a group of award-winning film students from Bath Spa University last week. I was at an event hosted by Oscar-winning film producer, Lord Puttnam, about ‘The Future of Film’ at Bath Spa’s state-of-the-art TV Studios. Industry experts from Pinewood Studios, IMDb and the BBC were in attendance and the calibre of the students’ work was truly world class. I look forward to seeing their future work on the small and big screen… maybe on Channel 4. At the end of May, we welcomed Minister of State for Digital and the Creative Industries, Margot James, who discovered more about our region’s strengths in digital and 5G technology Margot met some of the leading lights in 5G and we had another special guest too – Ada the humanoid robot from the University of Bristol’s Smart Internet Lab. Earlier this year we secured £5m from Government for the 5G smart tourism project, and this week submitted another ambitious £50m bid, which could lead to us becoming the UK’s first ever ‘5G region’. The government is searching for a city region to lead the country in a multi-million pound trial of new high-speed connectivity.